You will arrive at Tan Son Nhat International Airport if you travel by air to Saigon. Taking a taxi is probably the easiest way to get from there to your hotel. Walk outside of the airport, take a left, and you can see the taxis waiting for you. There are several good brands to choose. To get from the airport to the Pham Ngu Lao area, expect to pay a little under 160,000 VND (~$6.95USD). 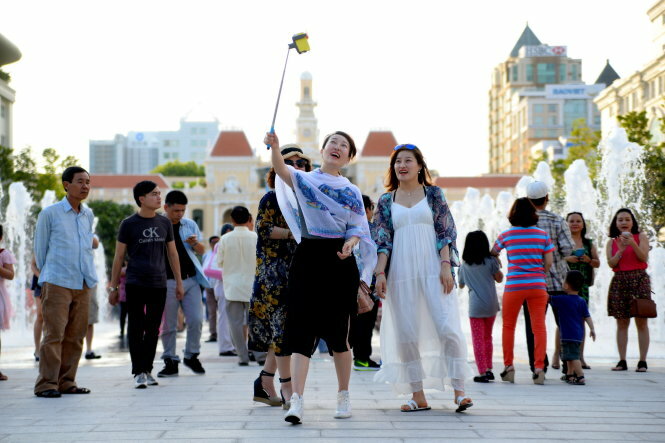 However, when you take a taxi in Saigon make sure you take a reliable company and pay attention to confirm the taxi is an authentic brand. Also if you want to make sure that you are on the right track, it is wise to keep your phone GPS with the map open so you can follow where the taxi is going. 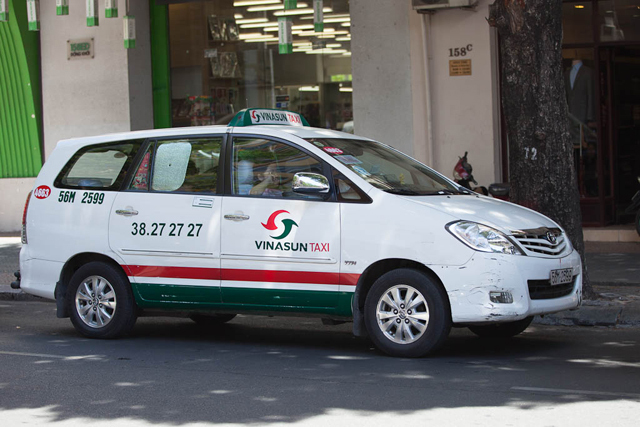 Vinasun: Not only being one of the largest taxi companies in Ho Chi Minh City, Vinasun is also one of the most reliable ones. Everywhere you go in the city can you see Vinasun taxis, with their green and red stripe. Just make sure to find the correct car with Vinasun logo and the phone number: 38 27 27 27 – written on the side of the taxi. Mai Linh – Together with Vinasun, Mai Linh is the other big taxi company in Ho Chi Minh City, which has gained many travelers’ hearts. Uber – Uber is the private cab service available in Ho Chi Minh City beginning to take off. Right after downloading the application, you will locate an Uber, and payment is all handled online. Thus, you will not have to bring cash with you. In spite of the application of technology, Uber costs you almost the same price, if not a bit cheaper than other normal taxis. To get into the city center, you can also take the bus, which costs you just 12,000 VND – 20,000 VND (less than $1USD). 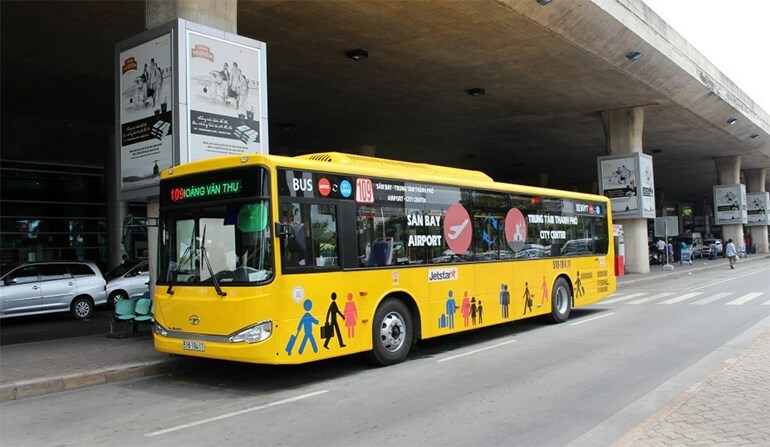 After walking out of the airport, you will cross the street and look for the bus No 109, which will take you all the way to Ben Thanh Market. Saigon is not quite as pleasant as a city for walking as somewhere like Tokyo due to the number of motorbikes that control the streets and even sidewalks. But that being said, you might like to think of walking in Saigon as sort of an obstacle course. You have to avoid oncoming objects, jump over encirclements, go around sprawling businesses, and go across the endless streams of motorbike traffic. If you can handle the traffic and heat (and traffic fumes), some of the central and most famous things to do in Ho Chi Minh City are located within walking distance. As you can stop whenever you like, and find stunning food along your route, walking is one the best ways to explore this city. Rent a motorbike – For those who have the confidence to rent and drive a motorbike themselves, there are a number of rentals agencies, especially situated in the Pham Ngu Lao area. Expect to pay about $10 per day. 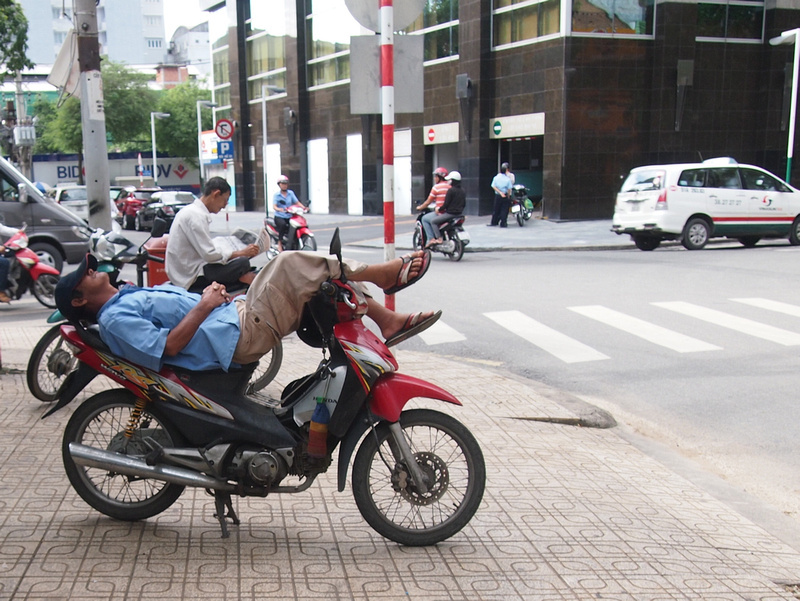 Motorbike taxi – On just about every corner of every street in Ho Chi Minh City, you can easily find men reclining on their motorbikes, sometimes tiredly sleeping, sometimes just gazing at the traffic and waiting patiently. Yes, these men are called motorbike taxi drivers. For a price, you will have them take you anywhere in the city you want to go, small journeys usually start around 20,000 – 40,000 VND (~$1-2USD).